Mark's Tickets is the best place to find tickets for Chicago Cubs fans. Just check this page for any new events or schedule updates throughout the year. We sell tickets to every Chicago Cubs game around the world. We know how passionate Chicago Cubs fans can be about baseball, so we make sure to have hundreds of tickets for every game available right up until it starts. For those looking for cheap Chicago Cubs tickets, we offer tickets starting at very low prices (many times below face value). 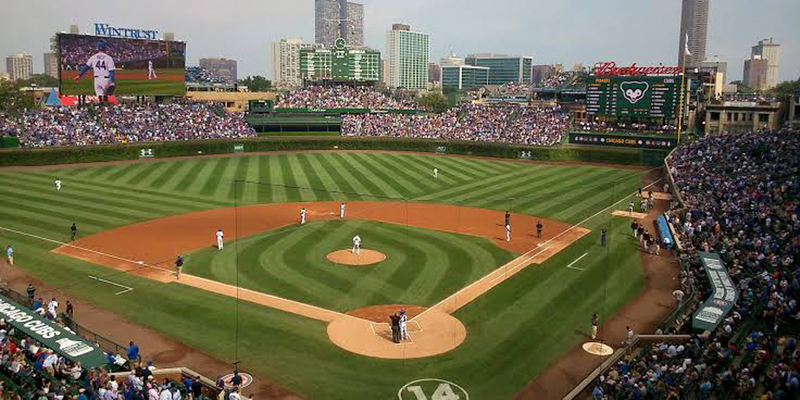 We offer tickets in most sections of every venue that you can see Chicago Cubs. Simply choose the city or venue that you are interested in below, and you will be able to see all of the available seats. Do not forget that Marks Tickets also specializes in sold out Chicago Cubs tickets. No longer will sold out shows prevent you from seeing Chicago Cubs. The Chicago Cubs are a professional baseball team that plays in the MLB. The Cubs play their home games at Wrigley Field in Chicago, Illinois. With 162 games per year, and 81 being home games, The Chicago Cubs are a professional baseball team located in Chicago, Illinois. They are members of the Central Division of Major League Baseball's National League. The Cubs are one of the two remaining charter members of the National League (the other being the Atlanta Braves) and one of two active major league clubs based in Chicago, the other being the Chicago White Sox of the American League. The team is currently owned by a family trust of TD Ameritrade founder Joe Ricketts. The Cubs have not won the World Series in 104 years, the longest championship drought of any major North American professional sports team, and are often referred to as the "Lovable Losers" because of this distinction. They are also known as "The North Siders" because Wrigley Field, their home park since 1916, is located in Chicago's north side Lake View community at 1060 West Addison Street (as opposed to their crosstown rivals, the Chicago White Sox, who play on the city's South Side). The club played its first games in 1870 as the Chicago White Stockings. This makes the Cubs, along with the Braves who were founded in 1871, the two oldest active teams in major North American sports. There is an argument as to who is actually older because although the Cubs are a full season "older" they lost two seasons to the Great Chicago Fire; thus the Braves have played more seasons. The Cubs are still the longest continuously existing franchise (notwithstanding the two lost seasons), having existed in the same city for their entire history.